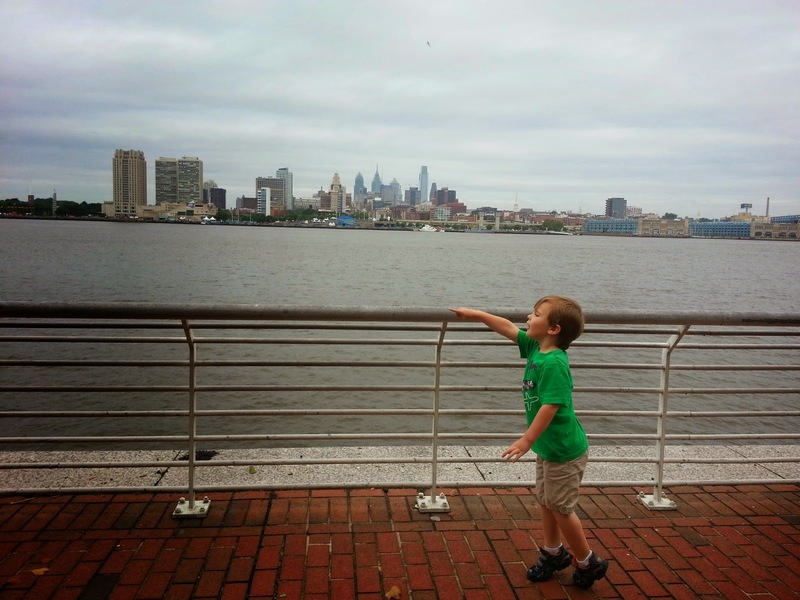 We had a fun day trip this weekend at Adventure Aquarium in Camden, NJ. 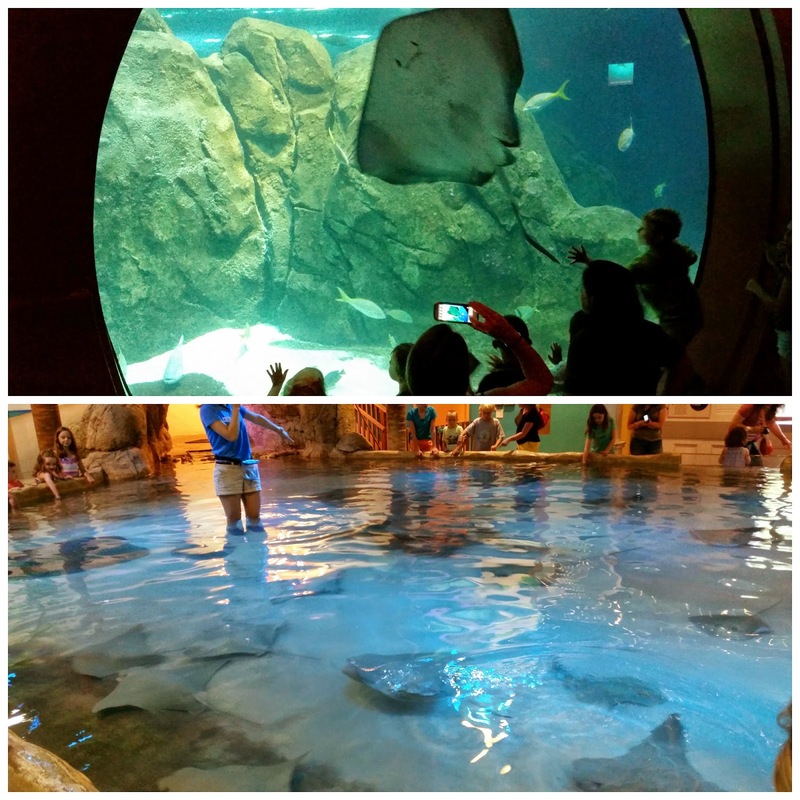 It was our first time at the aquarium, and we were VERY excited to see the newest exhibit, HippoHaven! Adventure Aquarium is the only aquarium in the world to exhibit hippos. 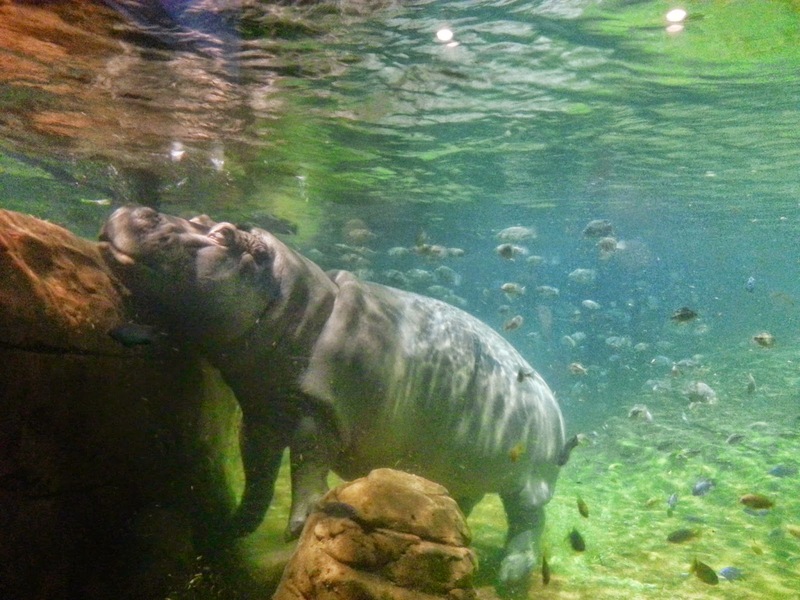 They've created a habitat to mimic the African river for the hippos, Button and Genny. They even allow guests to adopt a hippo through the Turgwe Hippo Trust, a non-profit organization in Zimbabwe. 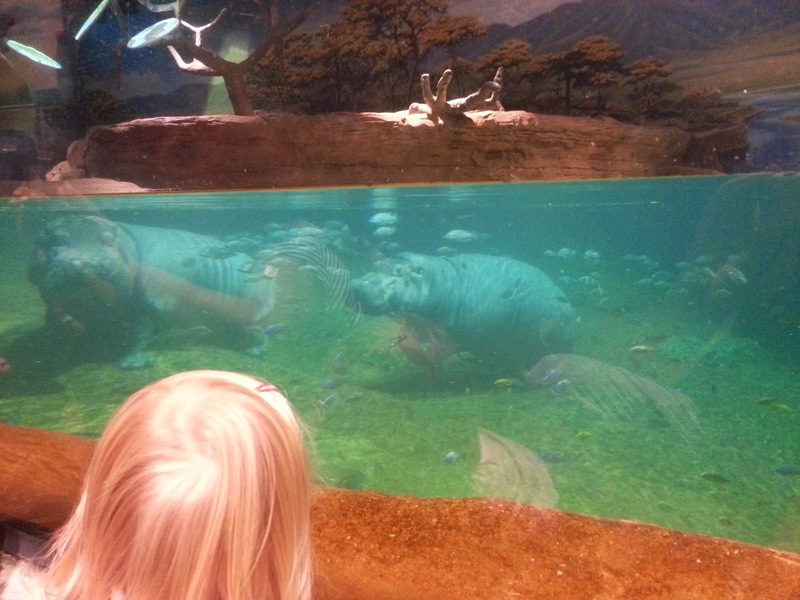 After visiting on a busy Saturday, we came up with 5 tips when visiting these awesome hippos. I hope you'll find them useful if you get to visit someday soon! Even though the aquarium opens at 10am, we got there at 9:30am just because traffic was lighter than we thought. It gave us a little time to take some fun photos (of excitement and anticipation!) before getting into the aquarium. It also allowed us to explore the waterfront area. 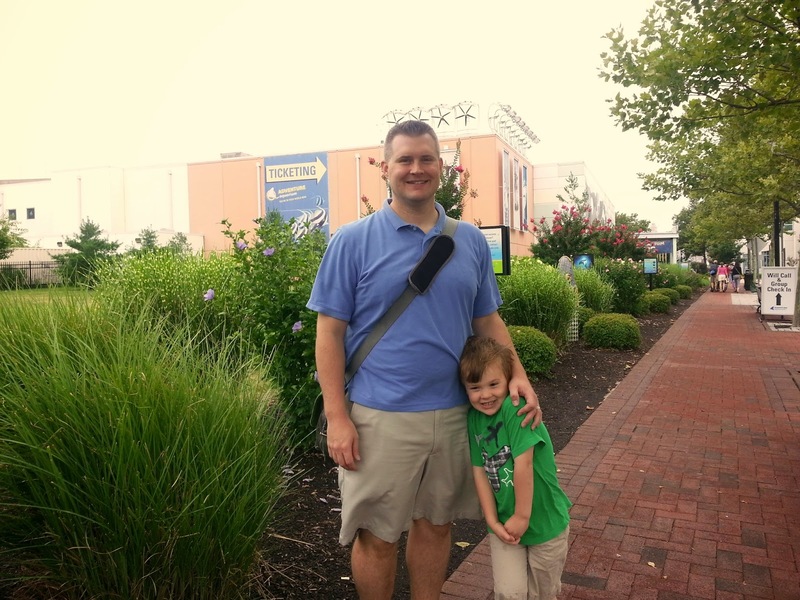 Daddy and Little Guy are excited for the aquarium! Little Guy spots a big ship on the water. 2. See the hippos first (or right before their feeding time)! We got to the hippos at about 10:15am. Their feeding time was at 10:30, so we waited to see them eat their fresh lettuce (did you know hippos are herbivores?). They seemed very active before and during their feeding. Later in the afternoon, we went back to say goodbye to the hippos before we left, and they were sleeping. So, visiting before/during the feeding might be the best time to see them! Little Gal is amazed at Button and Genny moving through the water. Genny (or Button!?) eating lettuce during feeding time. Thankfully Adventure Aquarium allows strollers inside. We used the stroller at different times to carry each kid when they got tired of walking, or just for all our bags and 'stuff'! Even though it started to get crowded later in the morning, we could still navigate among the crowd and other strollers. 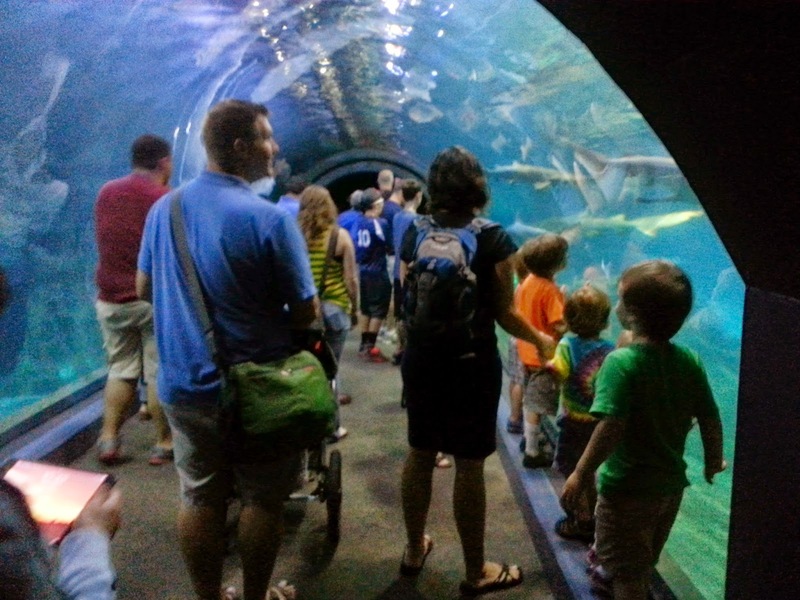 You can see the stroller even worked okay here in the awesome shark tunnel. Everyone gets a visitor guide upon entering the aquarium. 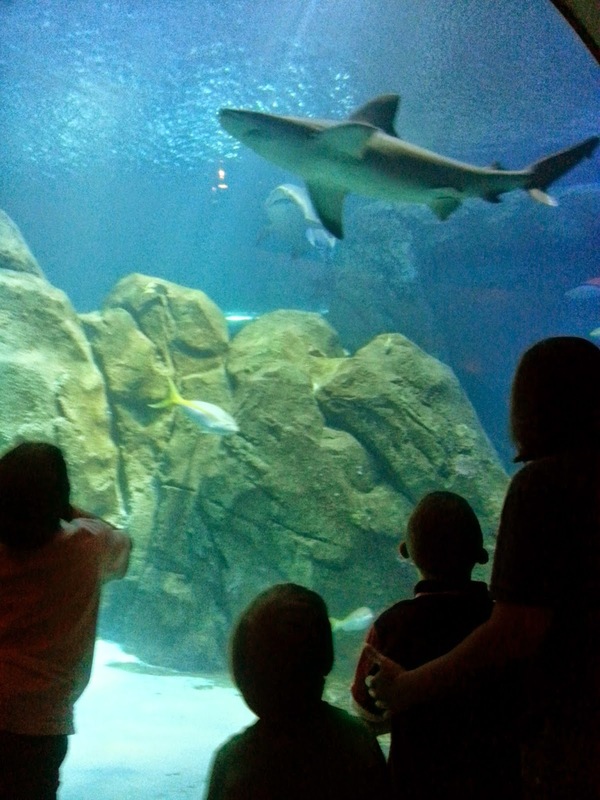 It includes a map and a great list of activities like penguin and stingray feedings and an opportunity to meet the divers (as you watch them swimming with sharks!). Try to catch some of these fun events. It's easy to spend all your time on the first floor seeing all the great exhibits. Make sure you save a little time (especially if you have young kiddos) to play at the KidZone upstairs. Little Guy and Little Gal loved the interactive exhibits. Little Guy even got to touch multiple starfish, a rare blue lobster, horseshoe crabs and other sea creatures! Both Little Guy and Little Gal loved playing in the KidZone. And finally, how can I go without mentioning what we ATE on our adventure? We packed our own lunches and snacks since we can't depend on finding lunch that's food allergy friendly. Thankfully the aquarium allows small coolers and bags, so we had no trouble bringing in food. Ready for some Hippo Fun Facts? Behind elephants and the White Rhino, hippos are the third-largest land mammal. Hippos can run up to 19 mph on land! Adventure Aquarium's hippos, Button and Genny, consume 70,000 calories per day. That’s nearly 40 pounds of food, or 115 Philly Cheesteaks! At 13 and 17, Button and Genny are teenagers! Hippos can live in captivity up to 60 years old. Hippos are able to sleep underwater, instinctively rising to breathe every few minutes. Have you been to Adventure Aquarium to see Hippo Haven? If so, how did you like it? 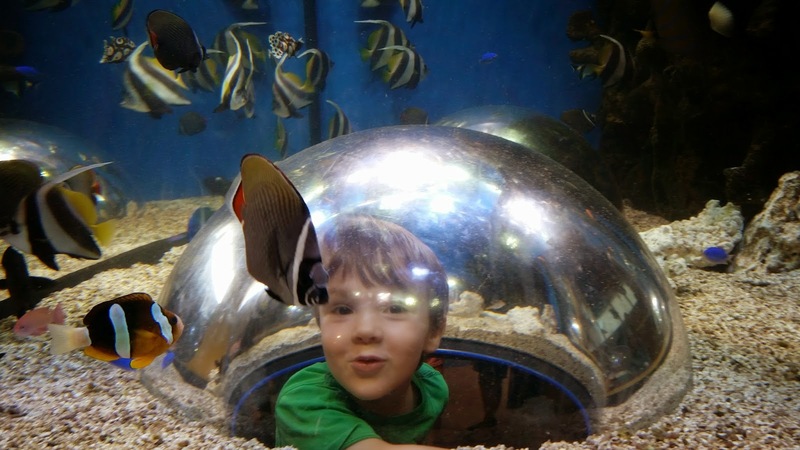 Disclosure: We were delighted to receive tickets to visit the Adventure Aquarium. The views and opinions expressed in this blog are entirely my own. Thanks Diane. We really did have a great time! I am always amazed by how graceful they are in the water! Appreciate this blog I was navigating through the exhibits in my mind and can't wait to get there again with my kid. I missed kidzone on level 2 will keep that in mind. Great Priya! Hope you enjoy your visit!